RUSH: Brian, throw this on the switcher. Social media is having the greatest time with the portraits of Barack Hussein O and Michelle (My Belle) O. And I just want to show you one example. 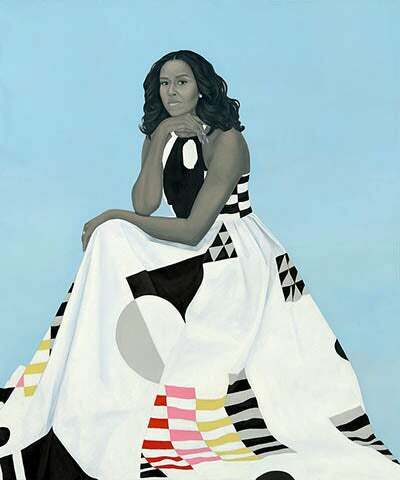 The Obama portrait interestingly is getting more heat than the Michelle portrait because of the “what is it” factor. What are these two trying to do? It’s obvious these two portraits are not gonna look like any other portrait anywhere, and that’s probably one of the objectives. But I think there are other components here. What we’ve just flashed up on the Dittocam is one sample of many satires and parodies of the portrait that are out there on social media. And this one over two-thirds of the Obama portrait is obscured by the American flag, which is encroaching on it from the left, and it is in the process of eliminating Obama from his own portrait. Standing in front of the flag is Donald Trump as an exterminator. 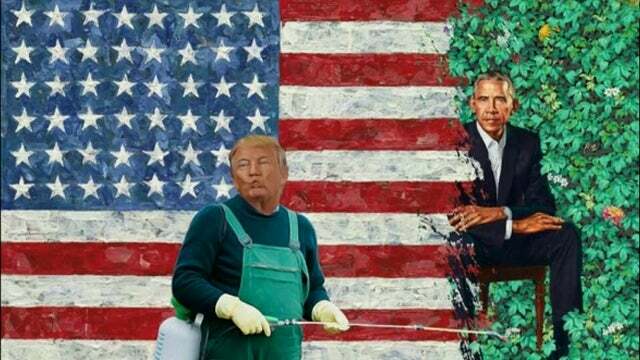 And he is spraying pesticides on the Obama portrait. And this is done to create the impression that America is getting rid of pests and that Trump is the guy doing it. And it works because Obama’s sitting there on this chair. That is the artiste responding to the rumors that Trump has tiny hands, and when you have tiny hands, it means that you have a tiny member. (For those of you in Rio Linda, ask your parents.) So what they’re trying to do here is say that Obama’s got one hell of a package and Trump doesn’t. That’s what the size of those hands is supposed to mean by that artist. 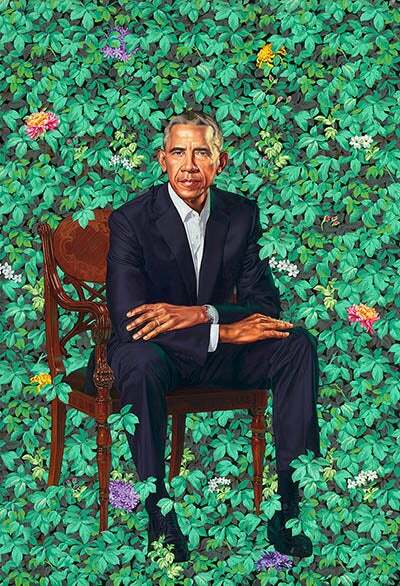 He’s sitting there, as some people say, and that portrait is Obama telling the world that he smoked weed while at the Ivy League. The artist says, “No, no, no, no, no. On his left hand, by the way, he’s got a fifth finger. He’s got an extra ring finger and his little finger, you can’t quite see it. But there’s an extra finger on that left hand as you’re… (interruption) He’s big, really big — so big you need an extra finger in there on the hand. No tie. He’s sitting in ways that women now complain as… What is it, man…? (interruption) “Manspreading.” Right. I get that confused with “mansplaining,” manspreading. Now, throw up the pesticide satire version, and that’s just one of many examples going around. RUSH: Time now to go back to the Dittocam. I’ve been waiting for the correct time. We have the pictures — I’m sorry. I’m sorry — the portraiture of Kehinde Wiley and two of his greatest works before the official unveiling of the portrait of Obama in the ivy yesterday. 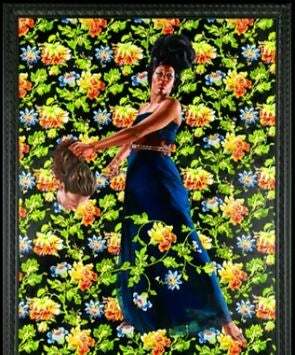 I mentioned to you that Kehinde Wiley is known for, he has a style, folks, and it features black women, African-American women holding the heads of beheaded white women. Holding the hair. And we’re gonna flash a couple of them here on the Dittocam. Here’s the first one. Now, again, you notice, for those of you watching on the Dittocam, notice all the floral activity going on behind that woman. Well, you have to look here to the left side. Follow that model’s left arm all the way out, and you will see in her hand is the beheaded head of a white woman. And this is a portrait — I don’t know who the women is, either of the women. I don’t know who the beheaded babe was, and I don’t know who the African-American babe in the painting is. But this woman’s standing, you know, in a bunch of flowers like Obama’s throne is sitting in a bunch of flowers. There’s one more that’s easier to see, still has a floral background, but it’s not as busy so this work of art is easier to see. There again an angry African-American woman gallantly, defiantly holding the head of a beheaded white woman. Now, we had a call from Kansas, an art expert who said that this kind of work was on display in Kansas City, that they’ve seen it. I’m by no means equipped to analyze this. All I can tell you is that just like that Andres Serrano Piss Christ piece of art, this is heralded as great. Okay. I’m not being profane. There’s actually a work of art that goes back to the nineties by a photographer, Andres Serrano. He submerged a crucifix in a jar of urine and called it Piss Christ. It was on display in New York museums, and it was heralded as one of the greatest interpretative pieces of art ever. And it was just junk. But we were told we didn’t have the sophistication to understand what the artiste was trying to say. And I guess the same thing here. I don’t have the sophistication to understand what is the social message. (interruption) Well, I see the artist’s anger. Well, yeah, I guess there’d be some anger if you’re beheading people and drawing pictures of it. Anyway, that’s the artiste who painted the Obama portrait.